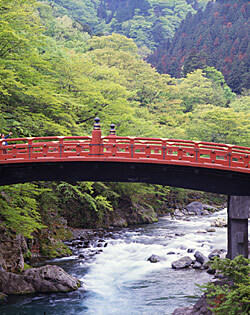 The Shinkyo bridge has been inscribed as a World heritage site in December 1999. It has been also designated as a national treasure. 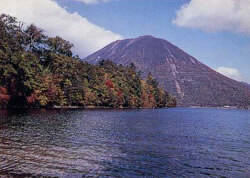 The Shinkyo had been fixed and repainted by lacquer from 1997 to 2005. Shinkyo is bright enough to decorate the entrance of holy Nikko. The lava dammed up a ravine by eruption of Mt. Nantai. Many natural beautiful places entertain visitors. Moreover, boating, fishing and camping become popular especially in the summer. Lake water flows into Kegon falls, and passes through the Daiya river. Finally, it runs with alongside of our building. Ieyasu Tokugawa has been enshrined there since 1617. 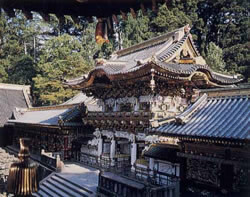 There are many national treasures such as Honden main hall and Yomeimon shiny gate. You will be surprised by decoration and its design on the sculptures and lacquer ware paintings. Call at our Asaya Resthouse after you were fascinated by those historical outstanding skills. Kirifuri falls, Urami falls and Kegon falls are known as three beautiful falls in Nikko. 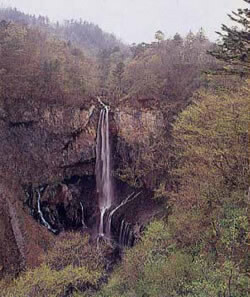 The Kegon falls locates the lakeside of Chuzenji. It is so powerful view when you took an elevator and go down to the basin of the fall. Have a break at our Asaya Resthouse after you enjoyed beautifulness of falling white spray.